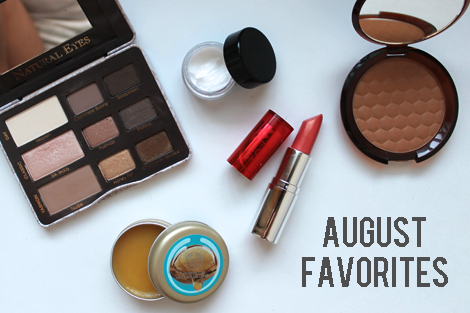 less is more: august beauty faves. 1. Too Faced Natural Eyes Palette // 2. The Body Shop Grapefruit Scrub // 3. Bumble and Bumble Sunday Shampoo // 4. The Body Shop Wild Argan Oil Solid Oil Lips // 5. The Body Shop Honey Bronze Bronzing Powder in 04 Deep Matte // 6. 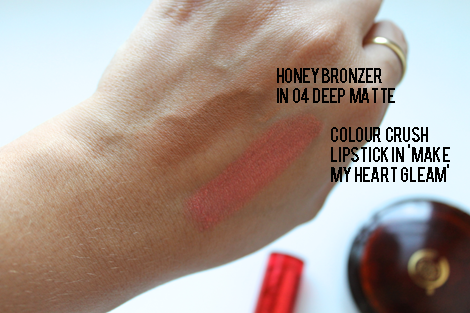 The Body Shop Colour Crush Lipstick in 140 Make My Heart Gleam // 7. Ole Henriksen Sheer Transformation // 8. 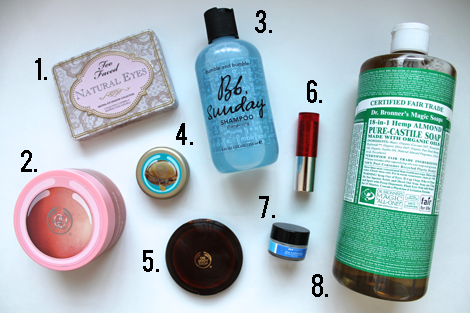 Dr. Bronner's Organic Almond Castile Liquid Soap The favorites from this month are a combination due to my splurge at The Body Shop as well my hair and my makeup brushes needing a nice deep clean every once in a while. I spoke about the Too Faced Natural Eyes Palette already, but to be brief, it's still the bomb dot com. I got a free sample of the Ole Henriksen face cream when I bought the palette, and I have actually been loving it. It's really thick, so not sure if I would recommend it for oily skin types, but I have dry skin and my face has loved it up real hard this month. A repurchase of the full size may accidentally happen. I've been washing my hair once a week with the Sunday Shampoo instead of my regular shampoo, and man does it leave my hair clean. I don't know what kind of magic is in that bottle, but after using it my hair is soft, silky, and just clean. Suuuuuper clean. The Dr. Bronner's soap has had similar effect, but on my makeup brushes. I have heard that the peppermint and lavender scents are more popular, but I went for the almond because I go nuts for nutty scents. My brushes feel so fresh & clean and my face is happy about that. I paid a little visit to The Body Shop early in the month, and while I only went in to pick up another grapefruit scrub, you know how it is. That being said, it's possible that the grapefruit scrub has been in a post before, but I cannot stress enough how great it is. It's exfoliating, it smells like heaven, and the tubs of it honestly last forever. I have been wanting to try the honey bronzer for a while, so I picked one up in 04 Deep Matte (it's not very deep at all if you ask me, my medium toned skin with a bit of a tan is actually a perfect candidate for the shade. I think once my tan is faded it will still be great, as long as I seriously tap the excess). I saw the wild argan oil range right up front when I walked in, and immediately gravitated to the solid lip oil. I love a good lip balm, and this is perfect for day to day, or if applied a little thicker, it's a great overnight balm. If you think that the Bite Beauty Agave Lip Mask is too thick, or you like it but don't use it all the time (like me) because it's a little too much for every night, then definitely try this solid oil. Lastly, I picked up the Colour Crush Lipstick because in store the swatch on my hand looked great, but to be honest, after taking the photos for this post (organized blogger fail) I wore it a few more times and decided that the color is a little bit too shimmery for me, and because it's a very sheer lipstick, eventually all that's left of it are the little shimmers, and I hate that. I like the formula though, so I think next time I'll give the a matte one a try.